This will be a relaxing and inspiring painting workshop and artists’ retreat in the Chianti Region of Tuscany, Italy. We will stay in an authentic 12th century monastery, San Fedele, which has been recently restored to modern first class lodging accommodations while retaining an old-world authenticity. 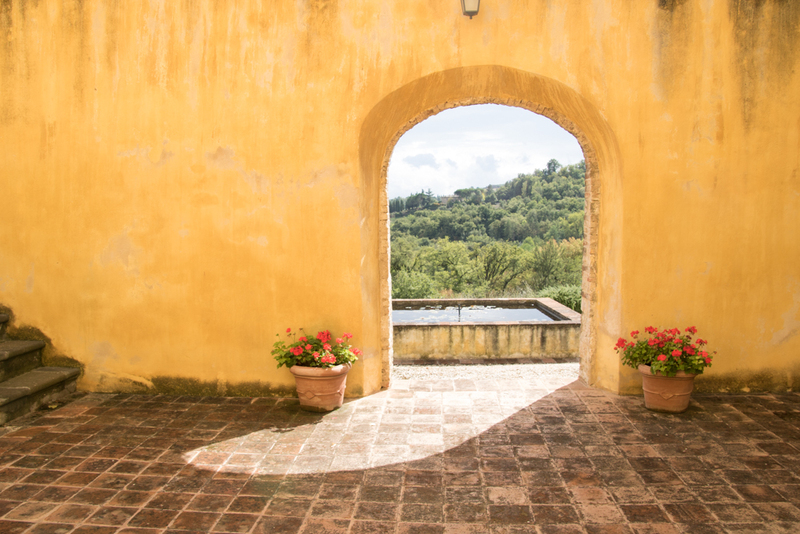 We will paint daily, either on site or on short field trips to view charming villages, olive groves and the beautiful, romantic Tuscan country- side. The workshop is offered through Il Chiostro. Artists of all levels and mediums are welcome and will leave enriched by this experience. Color as it is used in watercolor and as a tool for expression will be the focus of this workshop. Through individual mentoring, you will clarify your vision of how you want your work to be by exploring new techniques or honing your skill set as it applies to your watercolor practice. You’ll learn when and how to use various watercolor pigments that are granular, transparent staining and opaque as well as explore watercolors expressive capabilities. Demonstrations will address layering sequences, color placement , wet into wet and wash techniques..
Students will choose one subject to focus on for the full week and will reimagine it in fresh new ways and using a variety of watercolor techniques. Your chosen subject could be a singular idea or any combination of figurative, abstract, floral, nature, landscape or narrative subjects. This workshop is conducted on location on Deer Isle and in Stonington, Maine. Color- especially as it relates to watercolor is the focus of these workshops. 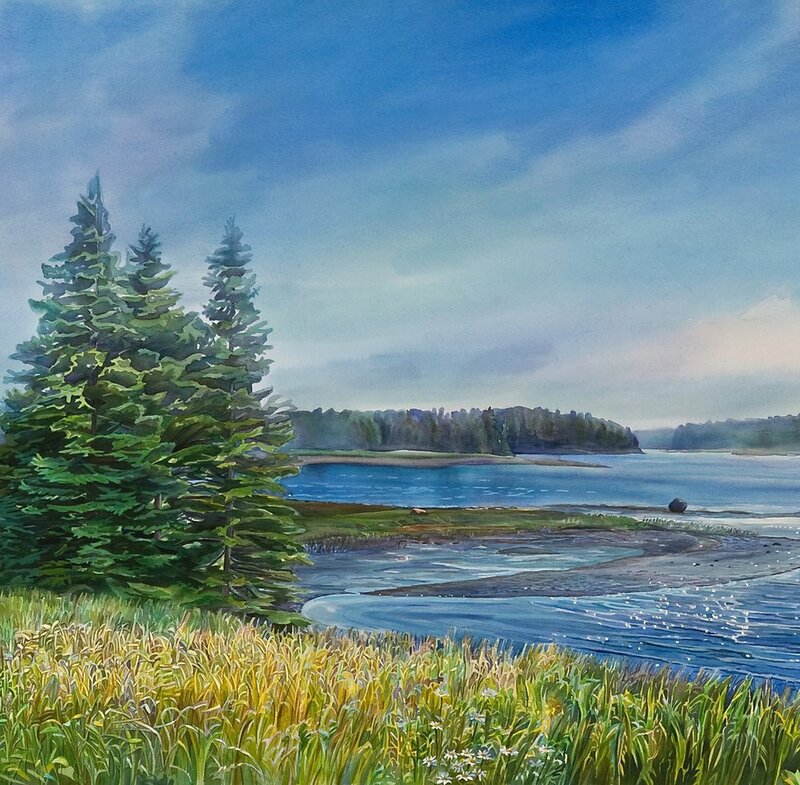 This magical coastal landscape is an inspiring place to paint and sets the stage for you to have a wonderful artistic experience with an accomplished artist who loves to teach. Dive into the world of color and learn techniques from this master watercolorist to better see, mix, choose, place and layer color. Stretch the way you think about and interpret color. Students will work on subjects of their choosing, reimagining them by employing watercolor's elusive qualities of spontaneity and transparency. Use color in fresh new ways, and learn the components of color mixing, wet into wet techniques, transparent layering and the qualities of light and shadow. A materials list will be sent with class registration confirmation. This class counts toward the Certificate in the Botanical Arts. Giverny in September is a beautiful time to visit, the walkways are carpeted with nasturtiums and you’ll also find sky high dahlias, sunflowers and many summer flowers. Exclusive morning and late day access to paint in Monets Garden. We are working on a wonderful itinerary with new places to visit!